Sreepur handmade charity Christmas cards. Orders are packaged in Sreepur handmade gift envelopes containing four cards of four different designs. Each pack costs £8.45 (UK p&p inc., + £1.00 Europe + £2.00 worldwide). Summer 2019 occasions cards now available! Our beautiful new designs of greetings and occasions cards are now on their way from Sreepur. Each pack of four cards costs £8.45 including postage within the UK..
> Give a gift of love with Sreepur Cards! 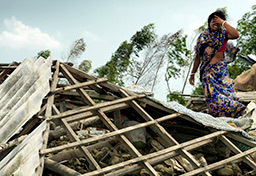 All proceeds from the sale of the cards are returned to the Sreepur Village where support and education help rebuild shattered lives . Sreepur Village was founded by Former British Airways stewardess Pat Kerr, and the Outreach Project extends the work of the village community into the outlying regions, enabling even more women to benefit. Visit > www.sreepurvillage.org to find out more about the village and its people. Sreepur Cards are high quality individually hand-crafted charity cards made from locally sourced natural products. 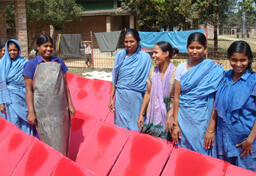 They are made in rural Bangladesh by the women of the Sreepur Village Outreach Project. The producer group have Fair Trade recognition and are able to work from home without neglect of childcare. Many charity cards are sold with the declaration that “100% of profits are returned to the charity” – this is very different to "all proceeds being returned." When you buy a Sreepur Card you are dealing directly with the Sreepur Village, Bangladesh – the cards are shipped to the UK at no cost by British Airways and all sales in the UK are handled by unpaid volunteers.